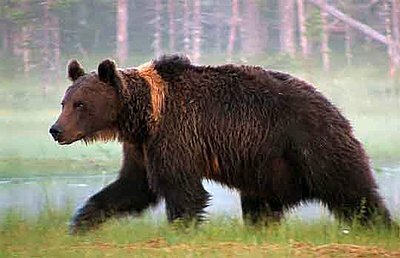 This short film show bears in the wild, deep into the forest of Finland. In fact this specific footage is shoot in "no man's land" at the Russian border. The scenery is just amazing, so is the sound of the wild. Hopefully I managed to get this sound, a combination of screams from the ravens, bears and the forest, into my film. I'm sitting in a hide, a small construction made of wood and plywood. Although the bears could easily knock down the constructions I'm sitting in I feel safe! The small pond of water creates a theather stage where the bears is passing to and from. The sparse light creates a very nice reflection in the water and creates a nice warm color in the bears fur. The surrounding of the pond consist of moor and you can hear the gurgling when the bears go through it, sometimes they even have to swim cause of the softness in the moor. Even with their big feet, the weight which is almost 600-700 lbs for an adult bear force it to sink deep into the moore. The reason they are taking a swim is to get rid of insects, mosquito etc. but also to cool down as they get rather warm struggleing in the moor. During this night I counted 12 bears in the area! All bears was male, the female bears and the youngster (cubs) are staying in Russia this time of year. The largest (and oldest) bear was constantly guarding the carcass forcing the other one to starve or challenge him! He was standing on his rear feet several times roaring when the younger bears came to close to him. Right: The fighting scene, the oldest and largest bear is showing his strength! Sounds awesome Per.....can't wait to see it ! Will provide a larger file for viewing/download a little later today. Appriciate any feedback to this one! Yikes, man..... Of course I went to your film first. Everyone has to see, and "HEAR" this fantastic film. Great subject, great filming. Can't wait to see it in a higher resolution format, though you did wonders with this one.. This is stunning and seems amazingly dangerous! 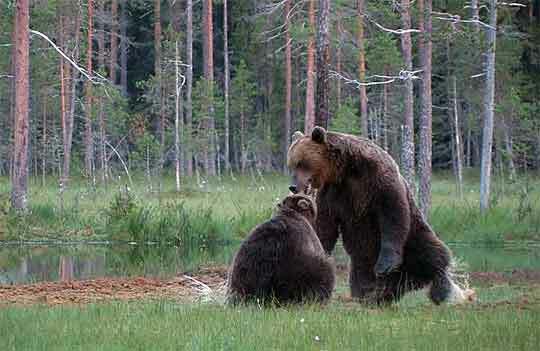 Are these grizzly bears? They are vicious animals! How far did you have to hike in to get there? Is the shelter permanent or did you have to contrive something yourself? Did you ever feel cramped and stiff sitting in there so long? How long were you there? Were you by yourself? Per, you are quite amazing and we are so fortunate to have your contributions to the group. That being said, even with the mastery of your camera work and editing I didn't think it spoke to the challenge topic "water". I also know that now that I have said this, Meryem will disagree for she holds very liberal interpretations of her topics. But to me, this was a sensational film on bears, not water. Thanks for this entry anyway! Those have to be the wettest bears I have ever seen on film, at least the one "shaking" itself dry. It's bad enough to be next to a dog doing that, I can just imagine how drenched one would be next to a critter THAT size. The audio was so clear, I have to know what mic setup you were using. The filming and editing were, as usual, superb. National Geographic level definitely. And I have to respectfully disagree with Catherine's feeling that this one does not speak to the theme of water. The bears affinity and relationship to the "pond" is on the theme as much as any entry that shows life in and around water. Some pretty amazing footage, as always!! But this is a little grander. Heck, just being that close to those big Bruins could be spooky just in itself!!! Did you have any background music in this? I couldn't hear it if there was. I like the way you edited the end of it!! I truly appreciate you sharing this footage!! Per, gotta agree with Dale, I loved the way you ended it. The relationship of the bears to the pond definitely fits with the theme. I can only imagine what it was like to actually be there. Nice job. Your film was the 2nd I watched after seeing what our young Gabriel came up with. Holy CENSORED CENSORED man that was the most CENSORED CENSORED CENSORED film I've seen. The light was CENSORED amazing and the audio was CENSORED CENSORED clear. So, let me just say that that was an incredible piece. Top notch all the way Per!! Per… this film is in another division… Top spot! It’s only one shot I didn’t like, the one when you are following one and then decide to change to the one who is itching its back… Is it possible to reedit that without the camera movement? Did you move to different covers? It looks like you were filming from two different angels? Can you send me a list of lottery numbers Per? No, seriously, that is a wonderful piece and you are very fortunate to get such great footage! First musk oxen, now bears (12 at a time! ), and you say you weren't scared!! You're a better man than I, Per Johan. The next film better be of dragons, or we will all be disappointed. So how big are the bears? They seem the size of the Grizzlies here in the states. I noticed that you were able to capture multiple angles; did you have more than one camera set up? And, what was it they were fighting over...something huge I imagine. If you are not already you need to be working for the likes of National Geographic...get an agent and get your footage out there, if you have not already. You have amazing patience and knowledge in order to capture such incredible beauty. Lovely video Per, did go out from the Wilderness Centre.